The pedestrianization of John Street will end in October, but it will be back next year—and bolder than before. The dust has settled on yet another instalment of TIFF, the Blue Jays are about to be caged for the fall, and patio season is nearly at an end. And on John Street, a new, summery initiative is about to pack up for the winter—though Torontonians can look forward to seeing the street pedestrianized again when the warm weather returns. 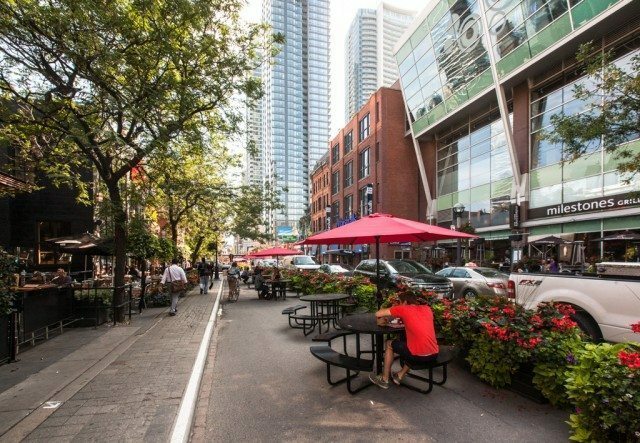 In mid-April, the Toronto Entertainment District BIA kicked off a six-month pilot project that closed one lane of John Street to vehicular traffic between Queen and Adelaide, replacing the cars with a row of tables and chairs (including 20 Muskoka chairs custom painted by a pair of OCAD students). Dubbed John Street: Toronto’s Red Carpet, the project lends a touch of glamour to what BIA executive director Janice Solomon calls the “central spine” of the Entertainment District. But it also offers a preview of a much grander project that’s in the works for next year: the John Street Pedestrian Initiative, which will include widened sidewalks, more trees, and slower traffic speeds to make the corridor more pedestrian-friendly. Solomon says the new, pedestrianized version of John Street has been compared to streets in Manhattan neighbourhoods such as Soho and Chelsea—and although tourists and Torontonians alike have made use of the new seating, she says the current setup doesn’t compare to that envisioned in the John Street Pedestrian Initiative. Toronto’s Red Carpet will be rolled up on October 12. The Entertainment District BIA will then release details of the John Street Pedestrian Initiative, and in the spring of 2015 hold public consultations on the project. Solomon says it’s been a long time coming.